As you decrease your carbohydrate intake on a low-carb diet, you generally need to replace those carbohydrates with protein. Although all low-carb diets are slightly different in their recommendations, in general, they restrict carbohydrate intake to less than 20 percent of calories and allow 25 to 30 percent of calories to come from protein. While it’s always ideal to get your protein from clean, whole-food sources like lean meats, eggs, fish, nuts, seeds and legumes, that’s not always feasible, especially when you have higher protein needs on a low-carbohydrate diet. Supplementing with a protein powder may be beneficial, but choosing one that fits into your low-carbohydrate diet plan will be the key to your success. The exact guidelines of a low-carb diet will differ depending on which diet you choose, but you can generally expect that you'll be limiting your carbohydrate intake to less than 20 percent of calories. This means that if you're aiming for 1,500 calories per day, you'll be taking in 75 grams of carbohydrates or less. About 25 to 30 percent of your calories will be coming from protein, which means that on that same 1,500-calorie diet, you'll be consuming 94 to 113 grams of protein each day. Although it's possible to meet these recommendations without supplementation, protein powder can make getting enough protein a little easier. For example, having two scrambled eggs in the morning provides 12 grams of protein, but a scoop of protein powder can provide as much as 24 grams. Protein powder is a supplement, though, and should be considered as such. It's best to use it to supplement a healthy diet rich in other sources of lean, whole-food proteins, like fish, nuts, seeds and legumes, and to limit your intake of protein powder to one to two servings per day. Protein powder on its own doesn’t have the chocolate or vanilla milkshake taste that many have become accustomed to. It’s actually fairly chalky and bland. To improve this taste, many manufacturers add sweeteners and flavorings, like chocolate, vanilla, strawberry or even cake batter. While this makes the protein powder sweeter and more palatable, it also increases the carbohydrate content. Sweetened protein powders generally contain around 8 grams of carbohydrates per serving, while unsweetened protein powders have only 1 or 2 grams. In the array of protein powders available on the shelves, you may see some boasting a low net carbohydrate count -- total carbs minus fiber -- but the real test is in the ingredient list. Manufacturers understand that many people looking to supplement with protein don’t want the added carbohydrate count, so they add carbohydrate- and calorie-free artificial sweeteners instead. This may seem ideal upfront, but Harvard Medical School notes that consuming artificial sweeteners regularly may actually lead you to crave more sweets and take in more calories during the day. There is also some evidence that artificial sweeteners may be addictive. 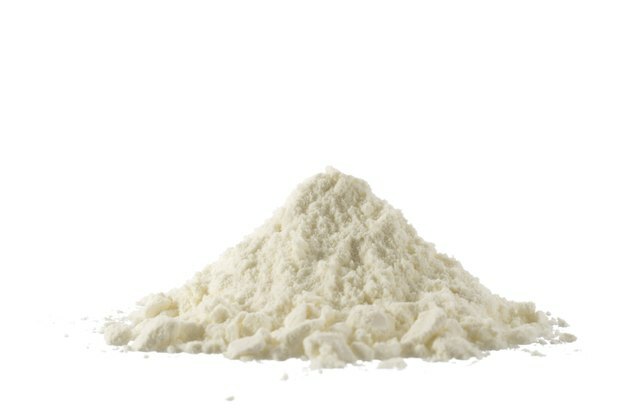 When you're following a low-carb diet, it’s best to choose an unsweetened protein powder that has fewer than 2 grams of carbohydrates per serving. If you can’t stomach the unsweetened varieties, opt for a protein powder sweetened with a low-carbohydrate natural sweetener, like stevia. You can also choose an unsweetened protein powder and make it more palatable by adding vanilla or almond extract or some flavorful spices, like cinnamon, nutmeg, unsweetened cocoa powder or ginger. Avoid protein powders that list sugar, corn syrup, dextrin, saccharin, aspartame, sucralose or sugar alcohols in the ingredient list. It’s not just the carbohydrate content you want to pay attention to, though. You also want to consider how easily digested and assimilated -- or absorbed -- the protein is. Proteins are given a score, called the protein digestibility corrected amino acid score, or PDCAAS, based on the amino acids they provide and how well your body can digest them. Proteins like whey, casein and egg whites have higher scores than pea and hemp. This means that whey, casein and egg proteins are more easily digested and absorbed than the plant-based proteins. Ideally, you want to pick a protein that has a higher PDCAAS score; however, you must also consider whether you can tolerate dairy and egg-based products when making your decision. Harvard Medical School: Artificial Sweeteners: Sugar-Free, but at What Cost?